David Bowman was a member of Clydesdale Harriers from 1935 until his death in 2007. He held every important office on the committee and outwith the club he served on many national bodies. At one point he was president of four athletics organisations at the same time. David was my great hero in the club and there were two things he felt important: you always did what your club needed you to do, and the club should take its place in the wider world of Scottish athletics. One of the best ever clubmen in any club in the land, what follows is a profile that I wrote as part of a book of club profiles. David Moir Bowman joined Clydesdale Harriers in 1935 – exactly 50 years after the formation of the club and has had an unbroken membership since then with only a spell in London from 1937 – 1938 when he ran with Queen’s Park Harriers to interrupt things. He had initially been invited to train with a group of runners from half a dozen clubs from the YMCA in Peel Street in Partick in Glasgow with the large plunge bath in the basement as an added inducement. The building had originally been part of HyndlandSchool and before the bare concrete bath was built in the basement four or five at a time would cram into an ordinary sized bath and scrub each other’s backs. Eventually a wrap around shower was added to the big bath. Starting as a sprinter, David gradually moved up through the distances until eventually specialising in the marathon. He raced at County, District and National Championships as well as at all the local meetings and Highland Games at Shotts, Cowal and Strathallan. It was in the mid-forties that he started ‘a wee bit of road running and this led to running in the Greenock to Ibrox Marathon in 1949 on the advice of Jock Semple. On one of Jock’s visits they were out on a run when the good advice was given. In the race itself he was sixth of twenty four finishers, defeating the club road race expert, Eric Paton. 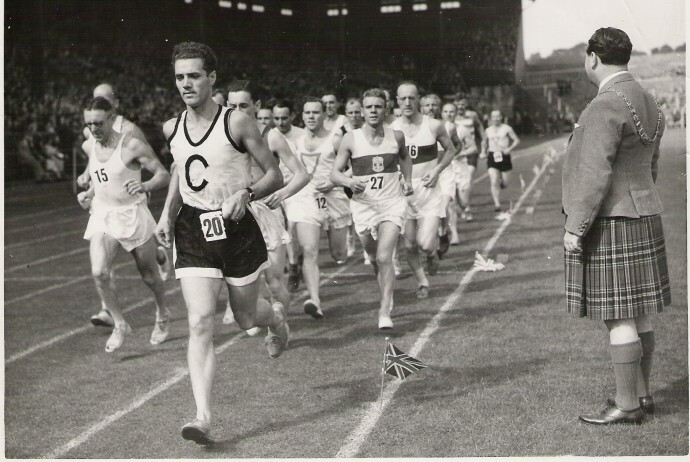 The 1950 Scottish Marathon Championship was held at Meadowbank and was won by Harry Howard of Shettleston Harriers in 2:43:56 with David being tenth in his first marathon in 3:02:51. The times were all slow by today’s standards but it should be kept in mind that apart from shoe technology, diet and clothing being much less well developed, the course organisers tended to look for tough courses in keeping with the marathon’s tough man image. The Isle of Wight Marathon was notorious and the Scottish Marathon from Westerlands in Glasgow out to the Vale of Leven and back was a series of long difficult hills and climbs. The 1952 SAAA Championship went from Methven to Dundee with the start being ‘beside a telegraph pole in the middle of nowhere ‘ according to the ‘Scots Athlete’ magazine. In a star studded field including CD Robertson (the winner), Joe McGhee (from Hadleigh AC), J Paterson of Polytechnic Harriers, Emmet Farrell and others. David was eleventh in 3:02:49. The 1953 marathon from Laurieston to Meadowbank was his best where he was fifth in 2:48:18 – ten minutes behind the winner. 1955 saw the race go from Falkirk to Edinburgh with Joe McGhee winning by almost ten minutes in 2:25 and David finishing tenth in 2:52:22. He picked up standard medals for the marathon on no fewer than six occasions and as an athlete is best remembered for his road running which included the Helensburgh to Clydebank road race – much harder than the more familiar Clydebank to Helensburgh version since it included the long drag and climb up from the start at the Pier Head in Helensburgh to Dumbarton. From the club point of view, David was the ideal club member and official. He was a first class ambassador for the club and the sport and great example to all members. He filled in wherever necessary and held every office on the Committee. He was President for ten years and treasurer for twenty two. He turned his hand to whatever the club needed whether the need were expressed or not. For many years he produced on his own initiative a single sheet containing the list of Committee Members, trophy winners, fixtures for the coming year and any significant dates in the coming season. This was neatly handwritten on a single sheet and folded to a size that would fit into a pocket diary. At presentation time he would personally collect the club’s many trophies, take them to the engraver and collect them in time for the presentation. In the 1990’s he added to the number by donating the David and Evelyn Bowman Trophy for the club’s top Field Events athlete. He had already presented the Janice Moir Wright Trophy (in memory of his daughter) in 1978 for the top Youth/Junior in the National Cross Country Championships. He also chauffeured many, many athletes to and from meetings and generally did as much as he could, often much more than could be expected, for the club. A remarkable record but arguably his biggest single contribution to the club was his work with Andy McMillan and others on the war time committee. The club had completely shut down during the 1914-1918 war for the duration of hostilities and lost out when the fighting was over because they had to start up again practically from scratch. The war time continuation committee from 1939 to 1945 kept the club ticking over while the action was taking place and met officially to start up again on the cessation. David was Vice Captain in 1945, Captain a year later and went on to be one of the longest serving of Committee Members. At National level he was recognised as a top class administrator and organiser. He was on the Committee of the Scottish Marathon Club for fifteen years, a member of the DAAA Committee where he held the offices of President and Vice President and he also chaired the Inter-Counties Athletic Association. At one point he was President of Clydesdale Harriers, the DAAA, the Scottish Marathon Club and the Inter Counties Association at the same time. As President of the Marathon Club he was responsible for helping organise the SAAA Marathon Championship for a number of years producing superb maps of the courses with a chart of climbs and descents along the way directly below the relevant part of the map. This championship was held separately from the Scottish Championships for many years and it was while David was President that it was re-incorporated into them. It should be said that the Secretary, Jimmy Scott of the Glasgow YMCA, was the real driving force of the SMC but he and David made a very good team backed up by an excellent Committee. The high spot of his administrative career however was probably during the Commonwealth Games at Edinburgh in 1970. He was Assistant Manager of the Scottish team with special responsibility for the marathon. His vast experience as competitor and official were responsible in no small way for the smooth running of the event which turned out to be one of the most exciting events of the Games, won by Ron Hill with many very fast times being recorded. He is pictured with Scotland’s Jim Alder in July 1970 after Jim had finished second to Ron Hill in the marathon. David was of the calibre to hold the highest offices in the sport nationally but chose instead to serve the club: a forward looking official and key man throughout his time on the Committee. Efficiency and David were synonymous: when the Clydebank Half Marathon had problems immediately before the first running of the event, the organisers turned immediately to David who had a panicky phone call less than twenty fours before the race asking for assistance. Despite being the best man for the job and having been ignored by the organising committee up to that point, he was courtesy itself and quickly sorted out the problems. From Doug Spencer of Garscube Harriers: “Looking forward to an excellent evening, tell George to keep his elbows to himself, David was too much of a gentleman to involve himself in the fine arts of aggression in cross country races”. And there were many more in similar vein. Another feature of David’s personality that stood out was his courtesy and sense of ‘the right thing to do.’ That sounds very po-faced but David wasn’t like that, he did like things done properly though. If as a Committee Member, whether as President or as an ordinary member, he felt something was not right, then he did his best to have it decided democratically. If he lost the verdict – and it didn’t happen often – then he accepted it and there was no ill feeling. He never ever imposed a decision unilaterally. One of the aspects of his personality that made him such a superb ambassador for the club and the sport was the fact that everybody got their place and no one was ever treated with less than respect no matter how badly they had behaved. His demeanour exuded dignity, efficiency, respectability and honour.